I've just returned from a week (with family and friends) in the Little Desert (early Oct, 2013), a superb Victorian national park. A bit like my recent Chiltern report, this is an update of my original report on the Little Desert. Basically it's my personal take on this wonderful park its good birding site, and some thoughts about the wonderful plants. In terms of birds, the park is pretty special. With a list of nearly 230 species, this makes it easily one of the best birding sites in Victoria. When I visit, I have a bit of a wish-list. 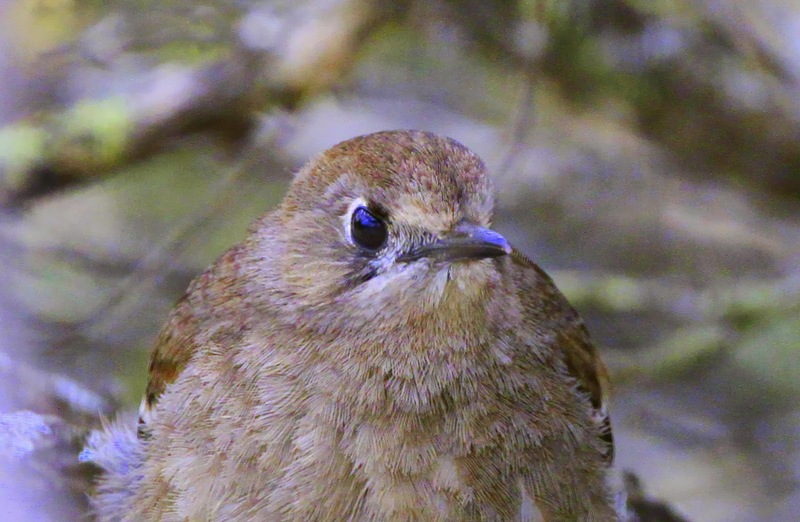 It's one of the only places in Victoria you might expect to see Slender-billed Thornbill - so I usually try and target that - and there's an uncommon and localized population of Rufous Fieldwren. While resident species worth looking for include Southern Scrub-robin, Shy Heathwren, Variegated Fairy-wren, and Purple-gaped, White-fronted and Tawny-crowned Honeyeater. Depending on the time of year, you can see Spotted Harrier, Blue-winged Parrot, and classic summer migrants such as Rainbow Bee-eater, Peaceful Dove, White-winged Triller and Rufous and Brown Songlark. Aside from these, it's always worth looking for inland and dry woodland birds such as Black-tailed Native-hen, Banded Lapwing, Purple-crowned Lorikeet, Spotted Nightjar, Buff-rumped, Inland and Chestnut-rumped Thornbill, Chestnut rumped Heathwren (rare resident), Gilbert's Whistler, Crested Bellbird (becoming increasingly rare), Jacky Winter, Red-capped and Hooded Robin and Diamond Firetail. There are occasional records of Painted and Little Button-quail, Black-eared Cuckoo, Cockatiel, Budgerigar, Australian (Mallee) Ringneck, Red-backed Kingfisher, Black Falcon, Orange and Crimson Chat, Black Honeyeater, Western and White-throated Gerygone, White-bellied Cuckoo-shrike, Forest Raven, White-backed Swallow and Zebra Finch. There are some interesting subspecies such as Grey Currawong (black-winged ssp melanoptera), Spotted Pardalote (yellow-rumped xanthopygus) , Varied Sittella (black-capped pileata) and the Variegated Fairy-wren (purple-backed assimilis). In terms of rare species to the park, more recently Elegant Parrot, rare in Victoria, has been recorded in the park, so this is another bird to look for. 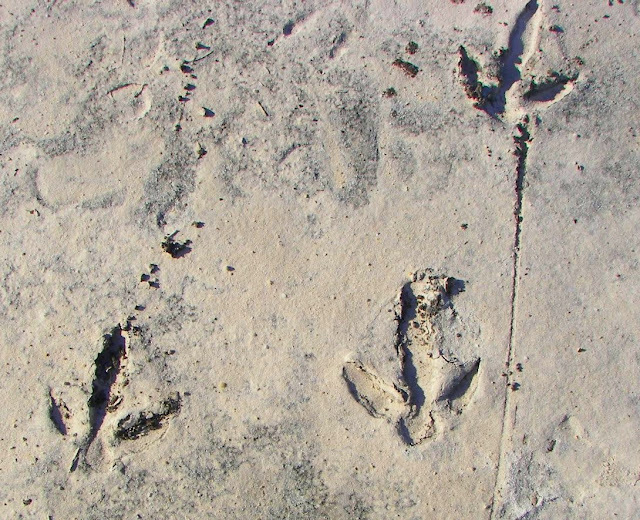 Importantly the park also supports one of Australia's southern-most population of Malleefowl; although, despite the park being known for its Malleefowl, they are fairly thin on the ground. Australian Bustard have been recorded several times - usually at sites that have been recently burnt. There irregular records Red-tailed Black-Cockatoo in the south of the park, and there are recent records of Bush Stone-curlew. The last time Regent Honeyeater was recorded was 1900, so I wouldn't count on seeing that species! 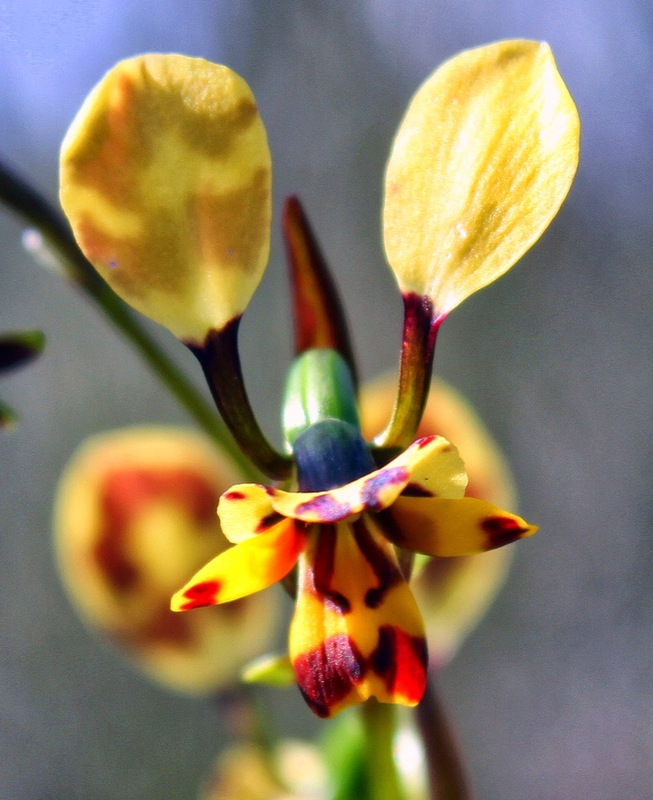 The Little Desert rates extremely high in botanical significance and, in late spring, after good rains, it's a fantastic place to see some spectacular orchids! Basically I've divided this report into five main sections: i. how to get there and where to stay; ii a look at the parks native flora and habitat types; iii. a description the stunning native orchids; iv. of course the good birding sites; v. and finally a brief look at the mammals and other fauna. For me, the best times to visit is in late winter, spring and early summer, when the temperatures are comfortable and the park comes alive with wildflowers and avian activity. The Little Desert Nature Lodge, colloquially known as Whimpey's. The Little Desert National Park (1350 sq. 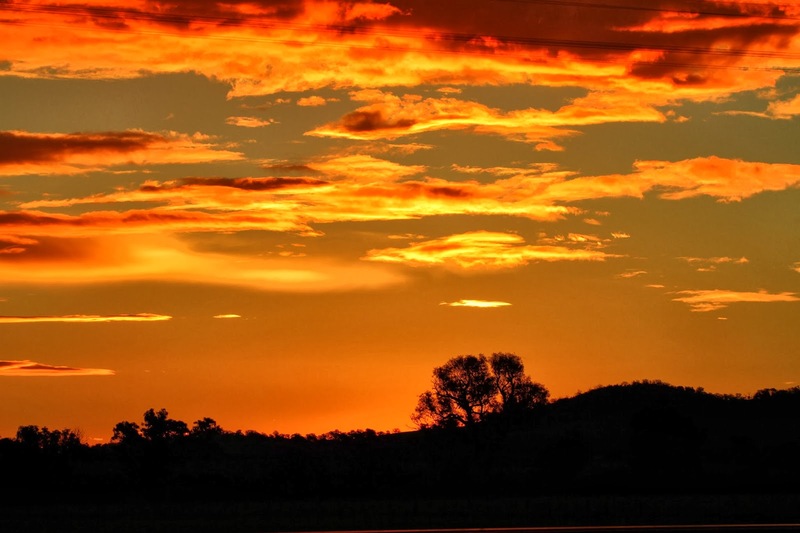 km) is located ~375 km from Melbourne, situated between the Wimmera River and the South Australian border. If leaving from Melbourne take the Western Hwy and keep driving; leaving from Adelaide take the Dukes Hwy and do the same thing, except head east! Accessed via Nhill and Kiata, the park intersected from north to south by the Nhill-Harrow Rd. This is a superb road to go birding along, one of my favourite 'birding roads' in Australia. It's worth noting that the myriad of tracks through the park are mostly not suitable are 2WD, with tracks like the Salt Lake Tk and Dahlenburgs Mill Tk very sandy and especially soft after rain. However, if you know how to drive through sand, and are willing to dig yourself out if you get bogged, these tracks can be great fun to drive. The western block can be accessed from Kaniva along the Kaniva-Edenhope Rd, and there are some nice 4WD track in that section, such as Mt Moffat Tk and East-West Tk. Another good place to stay - and probably the accommodation of choice for visiting birders - is the Little Desert Nature Lodge, colloquially known as Whimpey's. I've stayed there a number of times and, it's great, especially if you want a shower! It was established in 1969 by Ray 'Whimpey' Reichelt, who organized 4WD tours through the park. By doing so, he was one of the first people to draw attention to the parks fabulous wild habitats. Another key person in the parks history was Keith Hateley, who established the first Malleefowl wildlife sanctuary, later expanded to become the Little Desert National Park. Keith was the parks first rangers. The Little Desert Nature Lodge is located at the north end of the Nhill-Harrow Rd, about 16 km south of Nhill. On this recent trip, I stayed several nights at Kiata, and then a few nights in the Lodges bunkrooms, and the prices aren't much more than national park camp fees. At night, while eating dinner in the outside dining shed, several Southern Brown Bandicoot bounced around our feet looking for food scrapes. It's worth noting that an electrified feral animal proof fence surrounds the Lodge and the adjacent Malleefowl Sanctuary property. 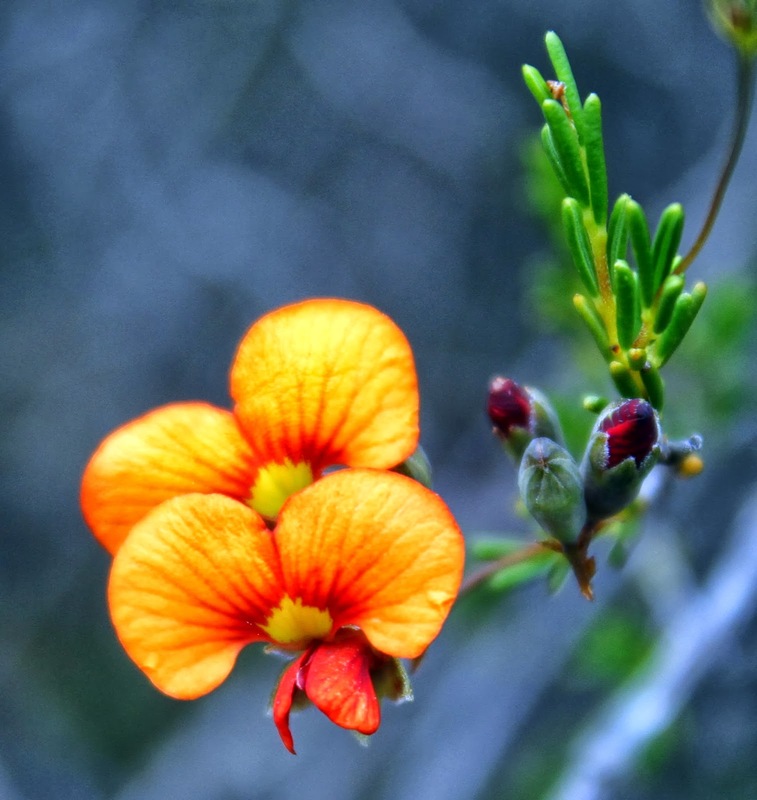 Despite the fact that the park has very deep sandy soils with low levels of nutrients and poor water holding retention, over 700 indigenous plant species have been recorded in the Little Desert. That's about one fifth of Victoria’s native flora species! Strictly speaking it's not a desert, receiving more rainfall than a 'desert' - about 500mm annually, ~150mm more than most strictly defined deserts. For me I've found the best way to understand the distribution of birds in the Little Desert is to understand the parks flora, particularly in terms of its main habitat types. Roughly speaking, I reckon there are three readily identifiable vegetation types, each determined by their soil, causing marked differences in plants. The outer edge of the Little Desert is dominated by (i) grassy woodlands, then slightly further in, (ii) Mallee and Mallee-Broombush woodland and shrubland, while in the center of the park we find (iii) low-lying heathland. There is also an assemblage intermediate between Mallee-broombush and the heathland. Each of these habitats have its own group of plants and its own selection of birds. Aside from these three main habitats, there are also a few seasonal / ephemeral swamplands, formed mainly over claypans (specifically in the western section of the park), there's some riparian vegetation along the Wimmera River and, of course, the park's bordered by extensive wheat and canola fields (good for Spotted Harrier, Brown Songlark and Eurasian Skylark). In terms of grassy woodlands, I usually like to visit two areas: the area around the Kiata campground, particularly along the start of the walks that lead out of the campground i.e. 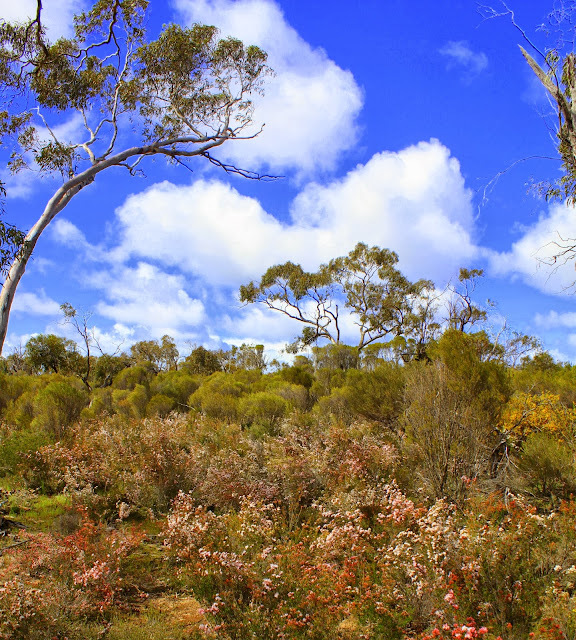 the Red Gum and Albrechts Mill Walks, and the Keith Hateley Nature Walk at the Kiata Sanctuary Picnic Ground. Large Yellow Gum (Eucalyptus leucoxylon), Grey Box (E. microcarpa), River Red Gum (E. camaIdulensis) and Drooping She-Oak (Allocasuarina verticillate), Oyster Bay Pine (Callitris rhomboidea) and Slender Cypress-pine (Callitris gracilis) dominate the herb-rich woodland community around the Kiata campground, and have a seriously herb-rich understory. This spring (Sept 2013) many of the plants were flowering. Black-Anther Flax Lily (Dianella revoluta) were prominent along the walking tracks, with delicate flowers hanging downwards, contrasted with the robust, strap-like leaves. Every so often I came across a Blue Star (Chamaescilla corymbosa), one of my favourite flowers - with each flower lasting just one day, although individual plants can flower for several weeks. Other blue flowers along the walks at Kiata included Broughton Pea (Swainsona procumbens), Grooved Dampiera (Dampiera lanceolata) and Twining Fringe-lily (Thysanotus patersonii) - like the Blue Star, each flower lasts just one day, and they only flowers in sunlight. Other flowing plants includes Silky Parrot-pea (Dillwynia sericea), Red Parrot-pea (D. hispida), Daphne Heath (Brachyloma daphnoides), Brush Heath (Brachyloma ericoides), Flame Heath (Astroloma conostephioides), their bright red, tubular flowers a favoured food for Emu, as are their red, succulent fruit, Austral Stork's-bill (Pelargonium austale) - what a great name - a plant in the same genus as the exotic geraniums found in our gardens, and Horny Cone-bush (Isopogon ceratophyllus) - I'd seen this intriguing species flowering just a few weeks earlier near Anglesea. Two of the Little Desert's pollinators: a Jewel Beetle (Castiarina decemmaculata) mimicking the coloration of a Black-headed Hoverfly (Melangyna viridiceps), or is it the other way round? Presumably one is unpalatable! Both feeding on Common Fringe-myrtle (Calytrix tetragona). A nice selection of bright yellow flowers shone out of the matt groundcover; the most obvious were Yam Daisy (Microseris lanceolata), Clustered Everlasting (Chrysocephalum semipapposum) and Hibbertia and Goodenia sp. such as Bundled Guinea-flower (Hibbertia prostrata), Twiggy Guinea-flower (Hibbertia virgata), Bent Goodenia (Goodenia geniculate) and Woolly Goodenia (Goodenia robusta). While creamy flowers included the fragrant candle-like heads of the Creamy Stackhousa (Stackhousa monogymna) and star-shaped honey-scented Milkmaids (Burchardia umbellata). The diversity was simply outstanding. I hadn't noticed this before, but at the start of the Albrechts Mill Walk there are several clumps of Spinifex (Triodia scariosa). Uncommon in the Little Desert, I associated it with Wyperfeld National Park and, from there, extending further north and west. Seeing it in the Little Desert reminds me of an isolated clump of Triodia I found at the Tresco West Bushland Reserve, near Lake Boga. Once again, it makes me wonder what exactly is the southern / eastern limits of this iconic plant. Between the open woodlands and the central heathlands, the park's vegetation is dominated Mallee. From what I can gather, six main species of Mallee eucalypt occur in the park - Yellow (Eucalyptus incrassata), Bull (E. belmana), Red (E. calycogona), Dumosa (E. dumosa), Green (E. viridis) and Green-leaf (E. phenax) Mallee. Good areas of Mallee occur along the Kiata South Rd, and on the road to the Kiata Campground, noting that both good spots to see Purple-gaped Honeyeater. Much of the Mallee is dominated by Broom Honey-myrtle (Melaleuca uncinata), or Broombush, creating a habitat type known as Mallee Broombush. Good spots of this type occur along the start of the Salt Lake Tk and the Salt Lake Walk (both beginning near the Kiata Campground), in the sandy ridges and laterites. Broombush its name from European settlers who used the branches to sweep their homes and, more recently, it's been used to make brush fences. It seems to me that Broombush Mallee has its own collection of plants, such as Broom Baeckea (Baeckea behrii) and Wallowa (Acacia calamifolia), the later produces flowers and seeds that are a favourite food for Malleefowl - and, in the Little Desert, this is the most likely habitat that you will see this species. While walking along the beginning of the Salt Lake Walk, Snow Myrtle (Calytrix alpestris), Common Fringe-myrtle (Calytrix tetragona) and Heath-myrtle (Micromyrtus ciliata) flowered profusely, attracting insects such as native bees, Thynnid wasps, flies, beetles, butterflies and ants. The common butterfly in the Little Desert is the Blue-spotted Painted Lady (Vanessa kershawi), they flew rapidly from plant to plant, frequently settling, wings outspread, on a plant to feed or on the ground to bask in the sun. In the afternoon I noticed that the males established territories around flowering myrtle, driving away any intruders. Also along the Salt Lake Walk the stunning Blue Star (Chamaescilla corymbosa), Inland Figface (Carpobrotus modestus), and Broughton Pea (Swainsona procumbens) were all flowering. Birds such as Shy Heathwren, White-eared Honeyeater, Inland Thornbill, Varied Sittella (black-capped ssp pileata), Variegated Fairy-wren and Shy Heathwren have a preference for this type of habitat. Also along the Salt Lake Walk I also came across and enormous cockroach. Possibly a burrowing-type, from the Macropanesthia genus? It was wingless and heavily armored, and emitted a load hissing noise when I startled it! In the central section of the Little Desert, the sandy swales and plains between the dunes, you find superb heathlands. It's dominated by Desert Banksia (Banksia ornata) and Silver Banksia (Banksia marginata), both species growing dwarfed in the Little Desert, only a meter or so high, due to low soil nutrient levels. They can grow up to 6 meters trees in the more fertile soils. 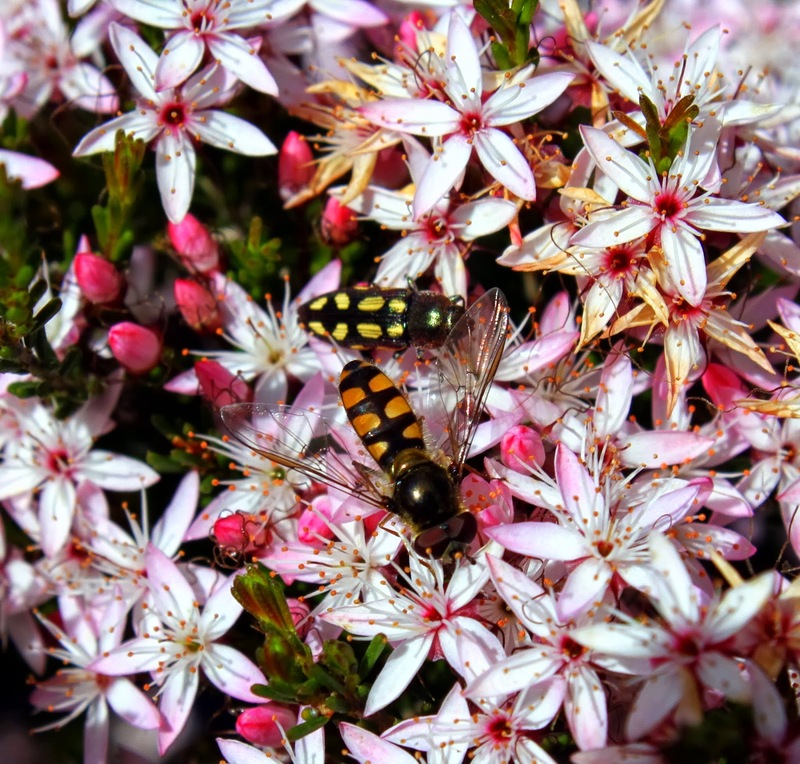 Other major components of the heath include Dwarf She-oak (Allocasuarina pusilla), Heath Tea-tree (Leptospermum myrsinoides), Mallee Honey-Myrtle (Melaleuca neglecta) and Violet Honey-myrtle (Melaleuca wilsonii), with its bright lilac flowers. 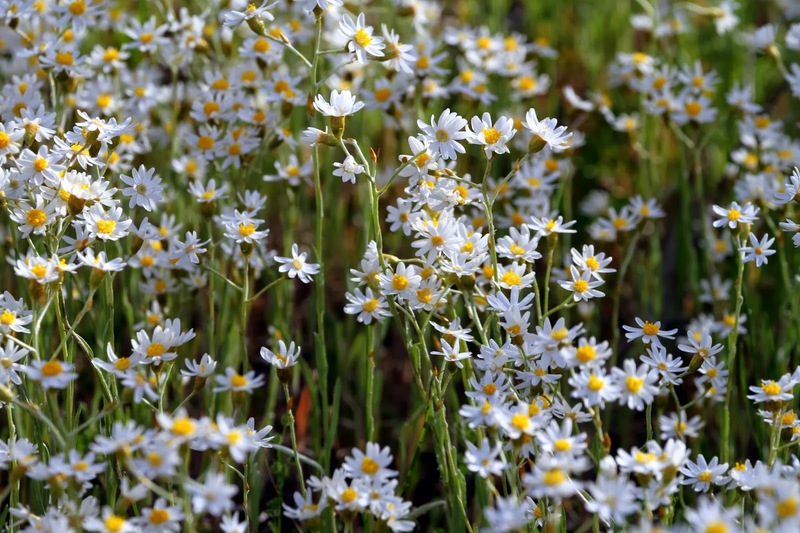 All these plants are hardy, semi-dense and compact, ranging from 2-3 m in height, and well-suited to low rainfall. Intermixed with the heaths are areas of Slender Cypress-pine (Callitris gracilis), Bull-oak (Allocasuarina luehmannii) and Desert Stringybark (Eucalyptus arenacea) - like the dwarf Banksia, they are a smaller, growing much taller in other areas of Australia, and a variety of plants such as Desert Common Correa (Correa reflexa var scaberula), Common Fringe-myrtle (Calytrix tetragona), Sweet Quandong (Santalum acuminatum), Golden Wattle (Acacia pycnantha) and Creeping Muntries (Kunzea pomifera). The Little Desert's Stunning Orchids! 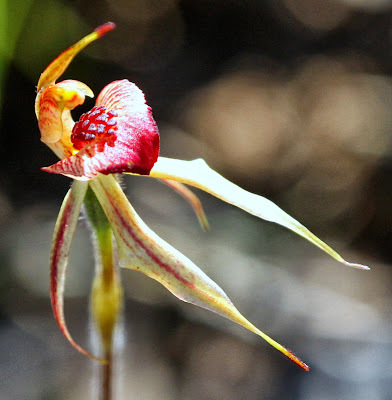 The Little Desert's terrestrial orchids are spectacular! This spring I found them everywhere, particularly along the start of all the Kiata campground walks, around here -36.448136,141.798486. I've found another good spot to look for them is along the Keith Hateley Nature Walk, as is Whimpey's. They were quite prominent in the small fenced-off area in Whimpey's, protecting them from hungry Emu and Western Grey Kangaroo. Orchids tend to be found in woodlands and forests at low altitudes, with a preference for moist, well drained soil. So, after spring rains, the low-lying sandy soils of the Little Desert are perfect! 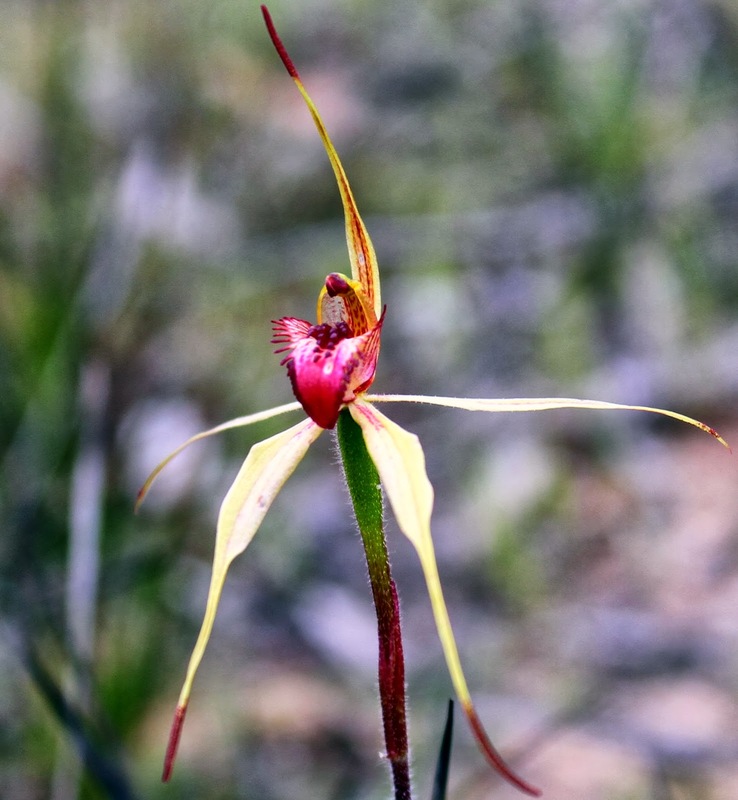 Perhaps the most prominent orchid was the Spider Orchids, including Green-comb Spider-orchid (Arachnorchis dilatata), Heart-lip Spider-orchid (A. cardiochila), Upright Spider-orchid (A. stricta) and a few endangered Wimmera Spider Orchid (A. lowanensis), an orchid known from only four sites in Victoria. 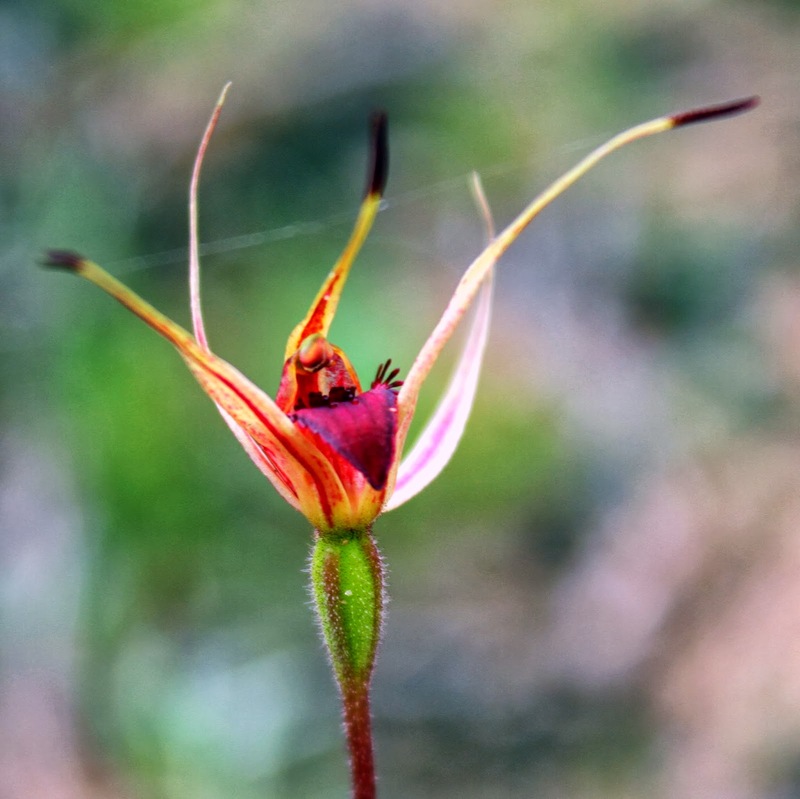 Aside from the Spider Orchids, Caladenia-type orchids seen included Hooded Caladenia (Caladenia cucullata), Pink Fingers (C. carnea) and White Fingers (C. catenata). Another genus of orchid that were present this spring were the superb Thelymitra, the Sun Orchid. 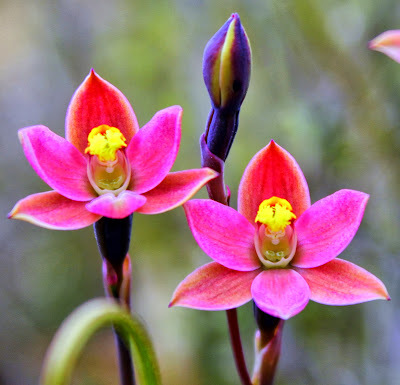 This spring found three types, Salmon Sun Orchid (Thelymitra rubra), Azure Sun Orchid (T. azurea), and the Rabbit Ears Sun Orchid (T. antennifera), the column has two distinctive red to brown interior "ears". The Thelymitra are amongst my favourite orchids; delicate, rich in color, and they only open in full sunlight. They also seem to appear one day, and then vanish the next. Finally, probably the most common orchid this spring was the Leopard Orchid (Diuris maculata), with clusters of orchids in a number of places around the park. Orchids always fascinate me. The huge variation of forms and colour lead to a bewildering array of species and hybrids, with many extremely morphologically difficult to separate. I've found identification's often confusing. 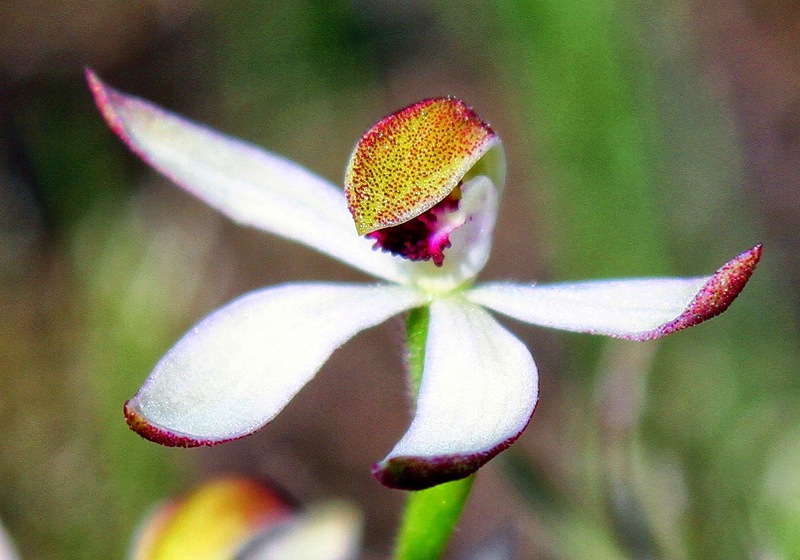 Perhaps not surprising, for instance recent taxonomy revisions have increased the number of Caladenia species significantly and split the genus into separate groups. 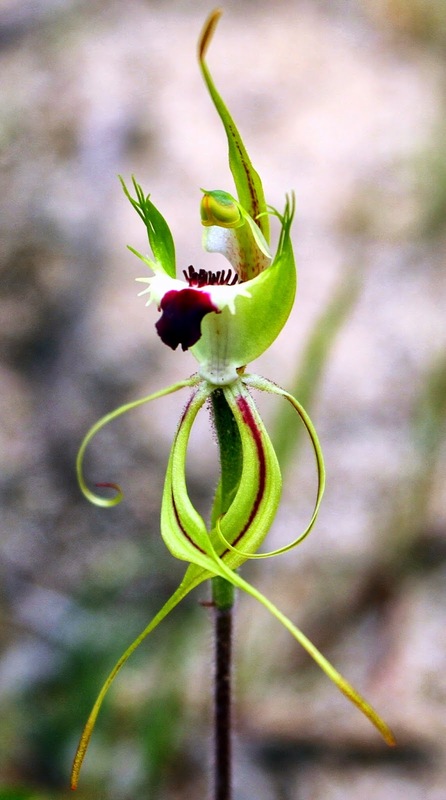 For instance Caladenia filamentosa alone has been split into ~40 different species and subspecies, while a number of subspecies have been upgraded to the status of full species, such as C. fragrantissima ssp. orientalis to C. orientalis. This makes some the splits and lumps in birds look like child's play! Grasswren taxonomy, phewee. Furthermore the complex interaction with pollinators, result in pseudocopulation, with the elongated flower tips producing sexual attractants known as pheromones, confusing pollinators, usually male Thynnid wasps, into thinking the flower is a female. Further to this, underground to this in fact, they have a complex mutalistic relationship with mycorrhizal fungi; the fungus assimilates nutrition from the orchid, and the orchid requires the fungus to germinate. When it comes to the orchids, it's a plant that lives on the edge, and the planet's life doesn't get much better. One of the best area of birding here is in the open woodland immediately south and east of the campground, particularly around the area that the main Kiata campground walking tracks begin. The most popular walk for me is the Red Gum Walk (~2 km). It's particularly good for robin's such as Scarlet, Red-capped, Hooded, Eastern Yellow Robin, Jacky Winter and Southern Scrub-robin. Just east of the campground, in the largest clumps of shrubs (-36.447765,141.800728), there is usually a pair of Southern Scrub-robin. In terms of the Jacky Winter, they are a woodland bird that's declining across most of its range. With a preference for grassy-woodlands that are not less than 10 hectares, unfortunately the average size of grassy woodland patches in the Wimmera is only 3.5 hectares. Other birds to look for include Peaceful Dove, Pallid Cuckoo, Rainbow Bee-eater, Restless Flycatcher, Rufous Songlark, White-winged Triller, White-throated and Brown Treecreeper, White-browed Babbler, Dusky, White-browed and (less commonly) Masked Woodswallow, Weebill, Tree Martin and Diamond Firetail, and I've seen Pied Butcherbird along this walk, rare this far south. It's probably the best area for parrots such as Purple-crowned Lorikeet and Eastern Rosella, and rarer visiting parrots such as Cockatiel, Budgerigar and Mallee Ringneck and, at night, listen for Southern Boobook, Australian Owlet-nightjar, and Tawny Frogmouth. If you walk along the start of the Salt Lake Walk (about here -36.453046,141.79607) - or the Salt Lake Tk, down to the vicinity of the water bore, 2 km south of the Kiata Campsite (accessed via the Salt Lake Tk -36.465299,141.796882) - you'll soon find yourself walking through Mallee Broombush woodlands. 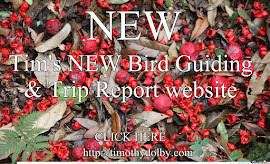 Here the birdlife changes, now seeing specialists species such as Purple-gaped, Spiny-cheeked and White-eared Honeyeater, Variegated Fairy-wren, Shy Heathwren, Gilbert's Whistler, Varied (black-capped ssp pileata) Sittella, Buff-rumped and Chestnut-rumped Thornbill, and look for uncommon species - there are records of Black and Pied Honeyeater and Crimson Chat in this area. Another good spot for Mallee bird species is the Kiata South Rd, near where it joins the campground road (-36.431503,141.7744), an excellent spot for Purple-gaped Honeyeater. If you bird along the roadside just north of the intersection, you'll find an old dam (east side at -36.43045,141.777252). Birdwise, this spot can be rewarding. Banded Lapwing often reside in the paddock immediately north of here (-36.428603,141.782316). Just west of Kiata, walk along the Keith Hateley Nature Walk at the Sanctuary Picnic Area, it also provides access to Mallee, again good habitat of the Purple-gaped Honeyeater. In spring the nature walk is a well-known site for orchids, and the rare Hairy-pod Wattle (Acacia glandulicarpa). One of the most productive areas for is the Banksia heathland bordering the Nhill–Harrow Rd, especially where it intersects with the Dahlenburgs Mill Tk. This area is adjacent to farmland, 3.4 km south of the entrance to the Little Desert Nature Lodge (-36.481157,141.653346). Search the knee-high heathland for Slender-billed Thornbill, a range-restricted species in Victoria. Take care with any identification because the superficially similar Buff-rumped Thornbill occurs here, though it generally occupies taller heathland. Another heathland / saltbush / samphire specialist, the Rufous Fieldwren, occurs here in similar habitats to that of the Slender-billed Thornbill. Here you may also see Yellow-tailed Black-Cockatoo, Blue-winged and Elegant Parrot (the latter in spring and summer; perhaps the best site in Victoria), Dusky, White-browed and Masked Woodswallow (all spring–summer), Purple-gaped, Tawny-crowned and White-fronted Honeyeater, White-fronted Chat, Variegated Fairy-wren and White-backed Swallow (summer). Brown Songlark and Spotted Harrier often occur in the nearby paddocks. Rufous Fieldwren tend to be more commonly found further south down the Nhill–Harrow Rd, such as along the start of the Phillips Tk, 8.8 km south of the Nature Lodge (-36.52976,141.645836), and along the intriguingly named McDonald Hwy (really just sandy track) 14.7 km south of the Lodge (-36.581875, 141.651050). Intersection of Dahlenburgs Mill Tk and Nhill-Harrow Rd, a reliable site for seeing the rare Slender-billed Thornbill and, more recently, Elegant Parrot. As an aside though, it seems to me that one noticeable absentee from the heathland of the Little Desert, when you compare to the coastal sites such as Anglesea, is Southern Emu-wren. The Mallee Emu-wren, found to the north of the Little Desert, is clearly a remnant population of Stipiturus, dating back to the regions coastal past, so what happened to the Stipiturus in the Little Desert? Perhaps knocked out by localized fires, a historical warning to the future of the Mallee Emu-wren. One of the most accessible areas to see a variety of birds in Little Desert is in the grounds of the Little Desert Nature Lodge. It's basically set out as a microcosm of the Little Desert, with a nature trail that walks you through areas of heathland, some nice woodlands, the 'native flora garden' and past a few small waterholes. The lodge has an impressive bird list including Emu (common in the grounds), Malleefowl, Brown Quail, Collared Sparrowhawk, Purple-crowned Lorikeet, Peaceful Dove, Southern Scrub-robin, Shy Heathwren, Gilbert's Whistler, Variegated Fairy-wren, Red-capped and Scarlet Robin, White-fronted, Yellow-plumed and Tawny-crowned Honeyeater, Restless Flycatcher, Chestnut-rumped, Inland, Brown and Yellow Thornbill, Diamond Firetail and, several years ago, I saw Western Gerygone. Salt Lake. Like, the Nhill-Harrow Rd, one of several places in the Little Desert to find Slender-billed Thornbill. The Stringybark Walk (-36.464411,141.656218), and its extended loop, starts of the Nhill–Harrow Rd just 1.5 km south of the Nature Lodge. A very pleasant walk, it's a good for heathland honeyeaters such as Purple-gaped, White-fronted, Tawny-crowned, New Holland, White-naped and White-eared Honeyeater. You also get Purple-crowned and Musk Lorikeet, Inland and Buff-rumped Thornbill, Shy Heathwren, Golden, Rufous and Gilbert's Whistler, and robin such as Scarlet, Flame, Red-capped, Hooded and Jacky Winter. At night, Bush Stone-curlew has been heard along this walk. The area around Salt Lake (-36.535235,141.80355), and in the heath along the Salt Lake Tk, hold similar species to this found along the Nhill-Harrow Rd. The knee-high heath around the lake used to be THE site in Victoria for seeing Slender-billed Thornbill - and they are probably easier to find here than along the Nhill-Harrow Rd. Other birds around the lake include Emu, Blue-winged Parrot, Purple-crowned and Musk Lorikeet, Tawny-crowned and White-fronted Honeyeater, White-fronted Chat, White-backed Swallow, Southern Scrub-robin, Hooded Robin, Jacky Winter, Australasian Pipit and Buff-rumped Thornbill. Beware though, the Salt Lake Tk is definitely 4X4 only - the long sandy stretches making it a challenging for drives. If you have problems, let your tyres down. When there is adequate water in the lake, it can attract Black-winged Stilt and Red-necked Avocet. Another good birdwatching in the Little Desert is the area around Ackle and Horseshoe Bend (-36.507842,142.01678), particularly where the heathlands meet the Black Box and Red Gum along the Wimmera River. This is a good site for the elusive Shy Heathwren, Southern Scrub-robin, as well as Purple-crowned, Musk and Rainbow Lorikeet, White-winged Triller, Spiny-cheeked, Black-chinned, Brown-headed, New Holland, Tawny-crowned, White-eared Honeyeater, while rarer species such as Black and Pied Honeyeater have also been records. Chestnut rumped Heathwren is rare in the Little Desert, however there is a small population along the 4WD McCabe Hut Tk. I personally haven't seen them there (or looked), but there are a few reliable recent records. One spot to look is along the McCabe Hut Tk ~3km north-west of Eagle Swamp (at -36.533036,141.93797) and along Charcoal Flat Tk (at -36.574767,141.957003). Snape Reserve (754 ha) is deserving of its own dedicated trip report, with over 170 species recorded. 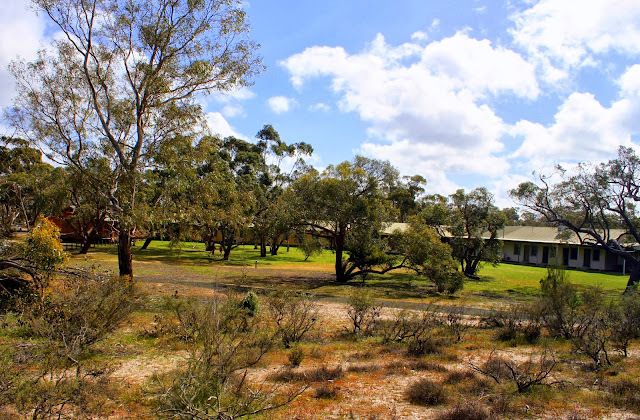 A Trust for Nature property, it's located directly adjacent to the Little Desert National Park, accessed via Pine Ave, just a few km south of Dimboola. It's named in honor of Diana and Brian Snape (a past Trust chairman), a great couple, you won't meet two more dedicated conservationists. In you wish to visit, contact the supervisory committee, details are on the website. Like Whimpey's Snape Reserve is basically a microcosm of the Little Desert, with all the main habitat types represented. The south side is dominated by large areas of heathland, there are several different types of woodland and some nice, open grassy areas. After good rains, ephemeral wetlands fill on the property, and can be excellent for water birds. The larger copses in the properties woodland contain Southern Scrub-robin, while the heathland is good for species such as Shy Heathwren, Variegated Fairy-wren, and Tawny-crowned and White-fronted Honeyeater. Other species to look for include Emu, Peaceful Dove, Rainbow, Musk and Purple-crowned Lorikeet, Rainbow Bee-eater, Painted Honeyeater (rare), Crested Bellbird (increasingly uncommon), and it is great for smaller passerines such as Striated, Buff-rumped, Yellow, Yellow-rumped, Chestnut-rumped, Inland, Brown and there is a chance of Slender-billed Thornbill (BANG, that's all eight Victorian thornbill! ), Weebill, Southern Whiteface and Diamond Firetail. A good spot to look for the smaller grassland passerines is the grassy areas in the top north corner. The last time I visited Wedge-tailed Eagle nested on the property, and after rain, you may luck upon Painted Spadefoot Toad and Mallee Spadefoot Toad. Most tracks in the Little Desert require 4WD. 20 km north of the Dimboola you will find the wonderful Glenlee Flora and Fauna Reserve (570 ha). 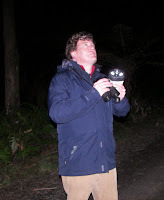 I've included it in this report because it's a great place to go woodland birding, and can easily be incorporated into an extended trip to the Little Desert. Classified as remnant Buloke-grassy-woodland, Glenlee contains one of the highest percentage of this type of grassland in reserves in Victoria. The soil structure of the reserve is predominantly sandy loam. Aside from Buloke, the reserves dominate vegetation includes Yellow Gum, Brown Stringybark, Blackbox, Buloke Mistletoe, Grey Mulga, Leafless Current Bush, Golddust Wattle and Golden Wattle. The grassy areas (near the bird hide - see directions below) were carpeted in swathes of the low-growing, white papery Blunt Everlasting (Argentipallium obtusifolium). 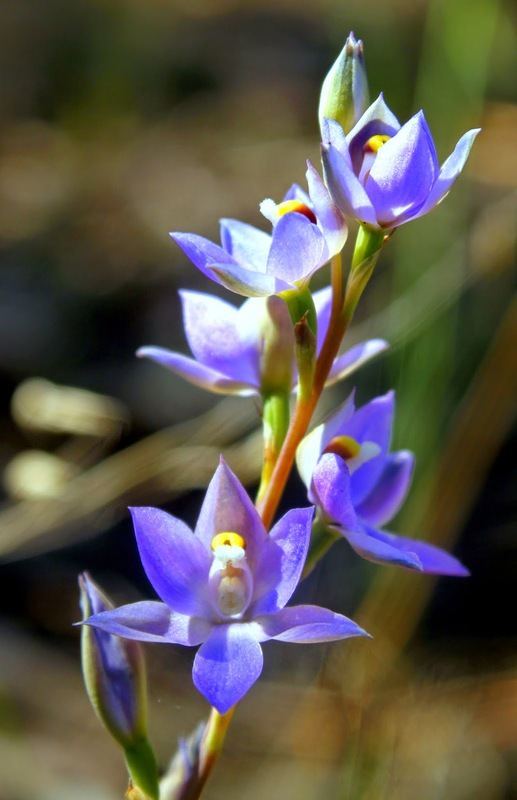 In terms of orchids there were flowering Azure Sun Orchid (Thelymitra azurea), and Glenlee is a primary conservation areas for the Mallee Spider-orchid (Caladenia lowanensis). Not surprisingly Glenlee has a wide range of woodland birds. Like Snape Reserve, it's good for small passerines: Inland, Chestnut-rumped, Striated, Buff-rumped, Yellow, Yellow-rumped, and Thornbill, Weebill, Southern Whiteface, Variegated Fairy-wren, Diamond Firetail and occasionally Zebra Finch. It's an excellent honeyeater site, particularly for Yellow-plumed Honeyeater, as well as Spiny-cheeked and White-fronted Honeyeater and I've recently recorded Black Honeyeater. Like the Little Desert, there are some interesting subspecies: Grey Currawong (black-winged ssp melanoptera), Spotted Pardalote (yellow-rumped xanthopygus) , Varied Sittella (black-capped pileata) and Variegated Fairy-wren (purple-backed assimilis). Other species to look for include Rainbow Bee-eater, White-browed Babbler, White-browed, Masked and Dusky Woodswallow, Restless Flycatcher, White-winged Triller, Hooded and Red-capped Robin, Jacky Winter, Brown and Rufous Songlark, Brown Treecreeper, Gilbert's Whistler and, at night, listen for Bush Stone-curlew (rare locally). The reserve's divided in two, a western and eastern blocks (either side of the Nhill-Jeparit Rd). There's a bird hide in the center of the eastern block with an associated water tray (-36.242716,141.847569), which is probably the best area for birding. To access the hide from the Nhill-Jeparit Rd (when driving from Nhill) take the first dirt track on your right (-36.233681,141.837437). After ~1 km turn up a track that lead north (-36.246999,141.844416), and the hide is another 200 meters (-36.242629,141.847483). You can also access it on foot via the Gerang-Glenlee Rd. The Western block immediately opposite the Nhill-Jeparit Rd entrance track is also worth birding. Finally, this is a very brief discussion of the Little Desert's mammals and other species. 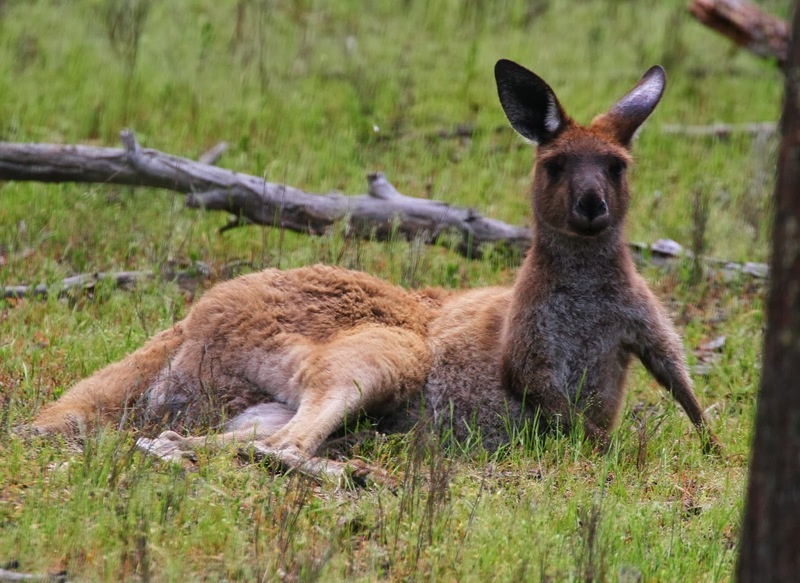 In terms of the Macropus, there are several species, all relatively common: Western Grey Kangaroo, Red-necked Wallaby and Black Wallaby - and there are occasional records of Red Kangaroo. The presence of Red-necked Wallaby in the Little Desert (and, nearby in the Grampians), always intrigues me. The closest population for this species is on Victoria's far-east coast. The Red-necked Wallaby here must represent a remnant population, a bit like the Glossy Black-Cockatoo on Kangaroo Island and Victoria's south-west Red-tailed Black-Cockatoo, all reflective of a time when there was a habitat link between east and west Victoria. A number of possum and glider species occur in the park, including Brushtail Possum, Little Pygmy Possum and Western Pygmy Possum, Sugar Glider and Feathertail Glider - if looking for the Pygmy Possum and Feathertail Glider, try spotlighting in the heathland. Silky Mouse is quite common, their burrow systems in the low Banksia heath are fairly distinctive. Other mammals include Echidna, Platypus (very rare, only occasional sightings along Wimmera River), Water Rat (records similar to the Platypus) and Fat-tailed Dunnart - a preference for grassy areas - and, at last count, 11 bat species. 32 species of reptile have been recorded. From memory the species I've encountered being Sand Goanna, Common Scaly-foot, Eastern Bearded Dragon, Jacky Lizard, Shingle-back, Western Blue-tongue, Eastern Brown Snake, Marbled Gecko, plus a few skinks, which, in retrospect, I should have paid more attention to. The park lists 9 species of amphibian, with the most noteworthy for me Painted Spadefoot Toad and Mallee Spadefoot Toad. These are your classic desert-type toads, burying themselves underground often for years at a time, only to appear after very heavy rains to breed. Once, while staying at Snape Reserve, heavy rains created a series small ephemeral wetlands to occur near my campsite. That night, several thousand Spadefoot Toad appeared, as if out of no-where, to breed in the puddles.